The flag of Zsombó is white with gold fringe, on the centre there is the Coat of Arms. Description in Hungarian at <linux.morahalom.hu>. Zsombó is a village in Csongrád County in Hungary near to City of Szeged (26 km northwest). The village has got 2.225 inhabitants (1990 census), all of them are Hungarians. Neighbouring settlements are: Szatymaz, Balástya, Forráskút, Bordany villages and Szeged City. The first mention of the name of the nowadays settlement is from 1717 as a territory of Szeged city. Later the territory of the settlement was part of Dorozsma (later Kiskundorozsma, now part of Szeged city) town. Dorozsma was in the Jász-Kun Free Territory (Jazygen-Cumania) till 1872. 1872-1950 part of Csongrád County. In 1900 Zsombó became a farmland center of Dorozsma. On 1st January 1950 Zsombó became an independent village. 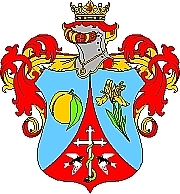 Description of the Coat of Arms of the village: Standing shield with pointed bottom divided into three parts. In the left blue field there is a gold peach with green leaf. relates to the occupation of the settlers of the village. In the left blue field there is a marsh iris relates to the flora of the settlements. In the red field there is a silver cross between two flying swallow. On the cross there is a green snake, its head is pierced by the cross. This symbol relates to St. Mary who is the title saint of the church. The blue fields relates to the blue sky - many sunny days are here in a year. The red field relates to the high cup of the Cumanians, who was the settlers its territory before the Turkish war and their descendants resettled the territory after the Turkish wars. The helmet on the shield relates to the heroes of the territory and the crown on the helmet relates to the self-government of the village.